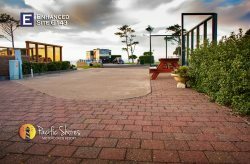 Welcome to Pacific Shores the ultimate year round Motor Coach Resort. Available with 50AMP, 30AMP, Water / Sewer hook up's, Cable TV & WiFi. Spectacular Lighthouse View, Close to Clubhouse and Beach Access. Close to Clubhouse and Beach Access.